After exchange with the author from doc-ok.org, now I believe measurement of FOV from the article is indeed in line with what it is in the close-to-final HoloLens prototype. After reading anon’s comments (in the comment section below), I headed to Doc-Ok.org, and read the article about the author’s 15min try-out of HoloLens. I want to add some updates and comments to this article. 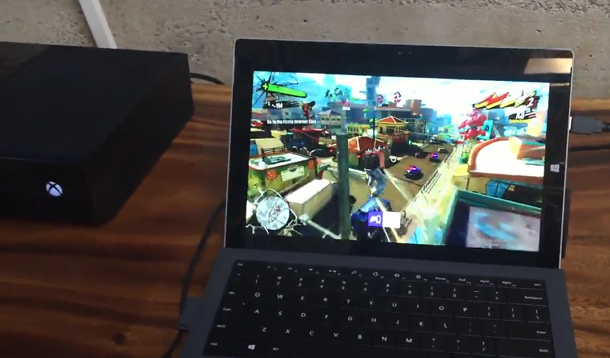 Reason #1 is this article is all based on the first prototype shown in January. As many have noticed, there is a big difference between current near-final product and the first prototype, mostly field of view. Reason #2 is even this post is out-dated, it is still of the most viewed. I choose to keep the original post intact, only add update right here at the top, because I am not convinced that the second demo unit is the product going forward and the first one is not, if you know what I mean. 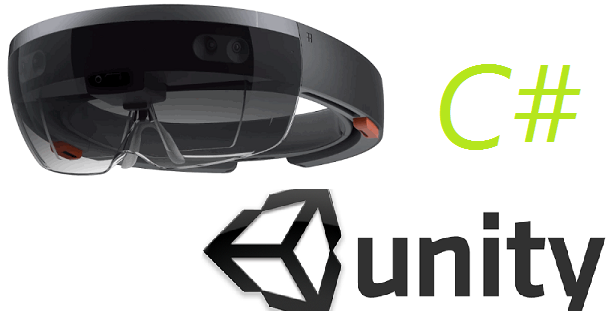 So, here is my comments to the doc-ok.org article: On the road for VR: Microsoft HoloLens at Build 2015, San Francisco. 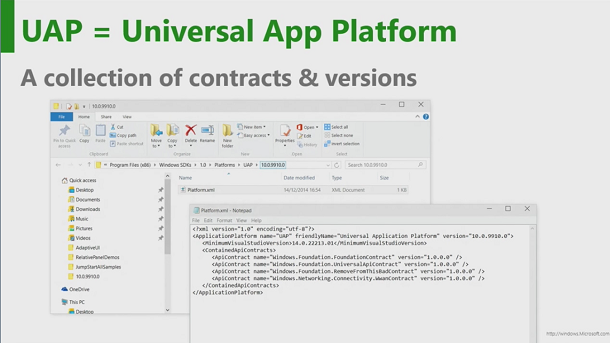 It is based on the BUILD 2015 unit, no reference of the first one. Regarding transparency, please read this post of mine. Regarding battery life, please read Guessing HoloLens Battery Life. Update on May 17, 2015 ends. Thanks anon for the head-up. Field of View (FOV) is the main topic for virtual reality (VR) and augmented reality (AR). Achieving the greatest FOV is one of major measurements of technical success, especially for VR. 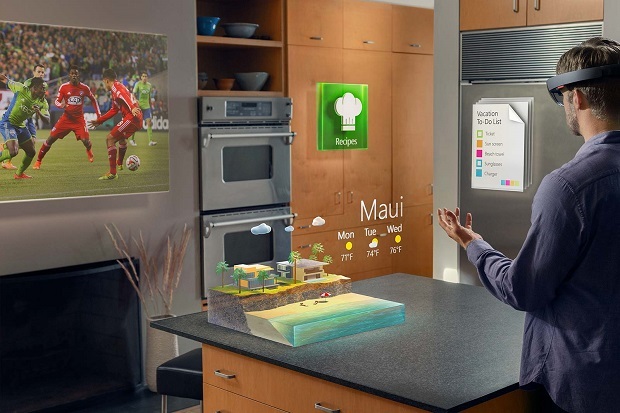 It is also a potential concern for HoloLens. Recently, I did some research on this topic. I also dove into the limited information I have with HoloLens. By putting these together, I am trying to give you a sense of satisfaction level regarding HoloLens’ FOV. Remember this is not an assessment of the HoloLens device. 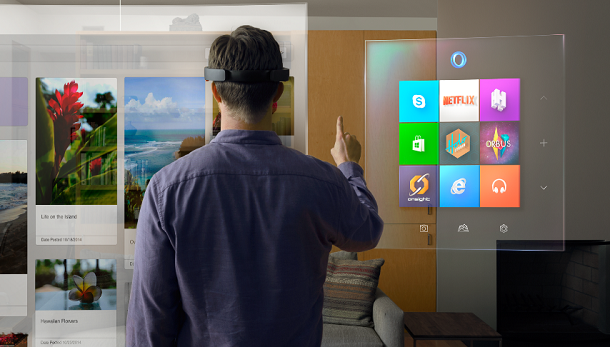 The writing is based on the mere information I have about HoloLens. Field of View (also called Field of Vision) is the extent of the observable world that is seen at any given moment (from Wikipedia). The term is used in the context of human vision or the view angle of instruments. To understand FOV, lets look at human peripheral vision as shown in Fig. 1 (also from Wikipedia). Peripheral vision is the part of vision surrounding the center focus. 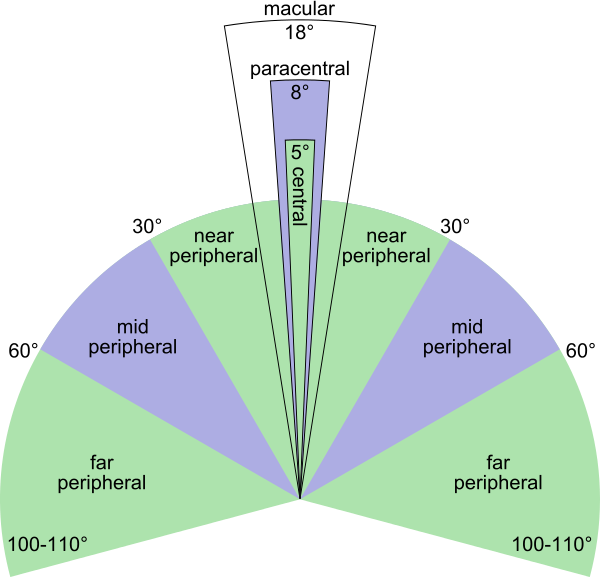 For human, peripheral vision is divided into difference areas: a 60 degrees of inner area called near peripheral vision (shown 30 degrees in Fig. 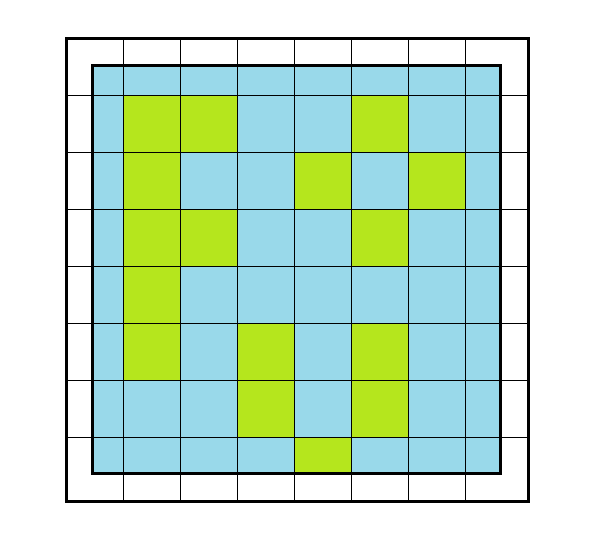 1, which is half of the symmetrical area). Outside the near peripheral vision is a 120 degree area surrounding the near peripheral vision, called mid-peripheral vision. Outside it is about 200~220 degrees of far peripheral vision. Generally speaking, anything inside of mid-peripheral vision is important to our vision (120 degrees), outside of it is good to have. Especially with eye tracking technology, far peripheral vision can be remedied greatly. For HoloLens, there are two FOVs: The depth senor’s FOV, which is what the sensor sees, and the wearer’s FOV, which is what the wearer sees. 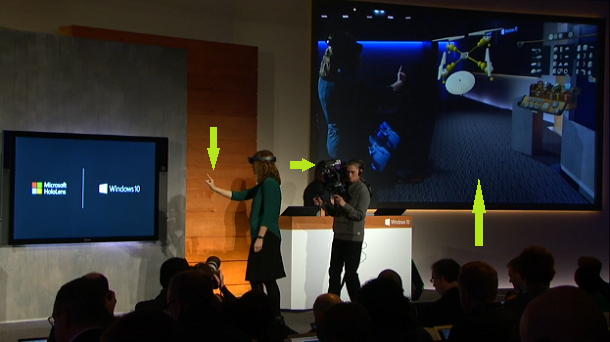 In HoloLens, the depth sensors are in charge of mapping the room and recognize user’s hand gestures. The FOV of the depth sensors directly affects these two things. For the first, it affects how wide a 3D space it can map. This is important for 3D space aware applications. For the second, it affects how well the main input method in HoloLens: hand gestures work. In some sense, the second is more significant than the first. We already know HoloLens has a field of view of 120 degree by 120 degree. To understand what that means, I took a statistical median of a regular man’s anatomical figures (Don’t ask how I figure that out). Also I want to point out the height of the person doesn’t really matter for any adults, because it only concerns distance from the eye to the joint of the upper arm and the forearm), and drew the figure and areas that the 120 degree vision covers. The result is in Fig. 2. In Fig. 2, the shaded area is the space HoloLens depth sensor can’t see. 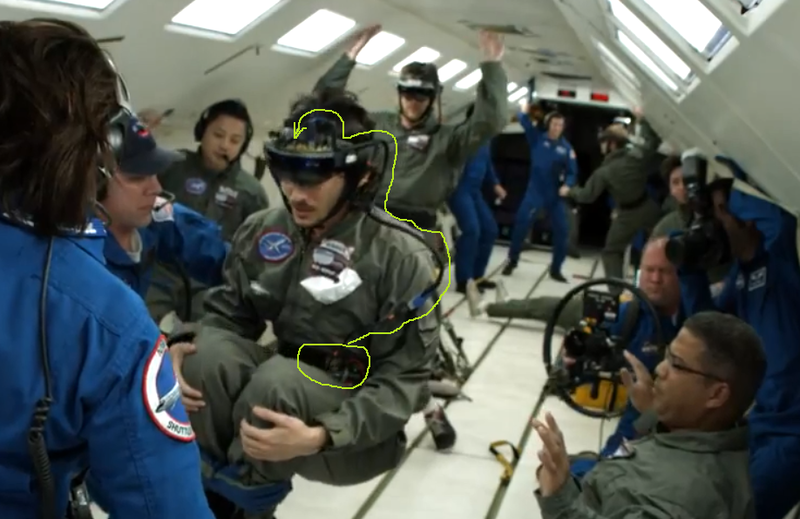 First thing we realize: if the person stands up, there is a certain 3D space close to the person’s feet cannot be seen by the depth sensors. The area gets much smaller when sitting down. I am not sure if there is technology in place to deal with it, but I don’t think it’s something important, unless applications really need depth info of that area. More interesting thing is: when you put down your upper arm, then keep your forearm to the front horizontally, the depth sensor should be able to see your hand. That’s important because that’s likely the bottom limit for hand gesture recognition. So, basically, in order for your hands/finger movement to be recognized, the afore mentioned pose should be enough, maybe raise the hand a little bit. That’s not what some have said you have to raise your hand to the mid-air. If you are sitting at the desk, just put your hands naturally at where you are using a keyboard, your hand gestures should be seen. …field of vision, it was fine, but I would liked to have seen more. Look straight ahead at a wall, now put a rectangle in front of you that takes up about 80% of your space, and that is what it is like. Remember this is just from his impression, we shouldn’t take his word literally. 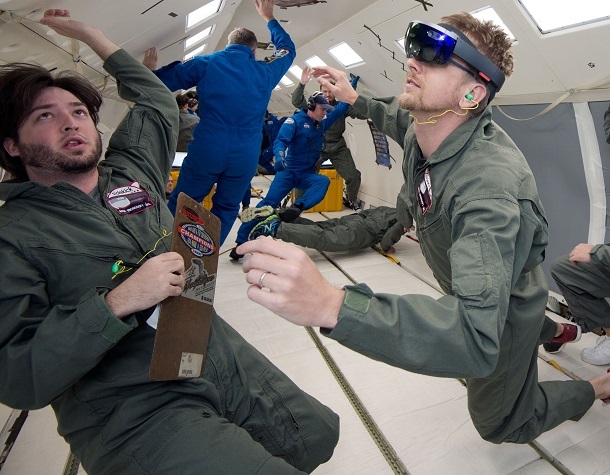 However, I feel that’s enough information to answer many questions about FOV of HoloLens. You have to do some homework as I do. I take the “80%” as 80% of digital area are visible comparing to a general 120 degree mid-peripheral vision (I have read his comment many times, and looked at many places to draw the conclusion). 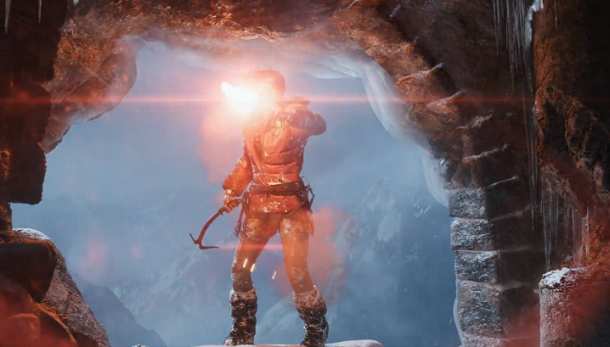 80% of the 120 degree vision is about 100 degrees of FOV (not linear, trust my math). I use Fig. 3 to show what it is like for a 80% area comparing to the whole. The pretend outer rectangle is the entire 120 degree of vision, the inner rectangle would be the 80% area. From the look of it, 100 degrees of FOV is pretty good. It depends on your purpose, for totally immersive gamming like VR does, this is probably not enough. I believe the FOVs in VR are bigger than that, but for anything else, I think it is not a concern at all. Thanks for the comments. You are right. I’ll be working on it. Two things here: 30×17 is probably referring to one side angle. If you have 120 degree FOV, someone may call it 60 degree. Even with that, I think it is a bit off to say 17 degree, but I will read the article. Thanks you so much for this picture. When I read your article, I pictured exact how you did. That’s about the most credible measurement so far. Thanks. I thought you would count pinkies. Any way. Now I believe you are right. Why? Because I don’t think they are picking a random number for the angle. So, 18 degree is probably intended, because 18 degree is pure center view, no peripheral vision. Nice work! 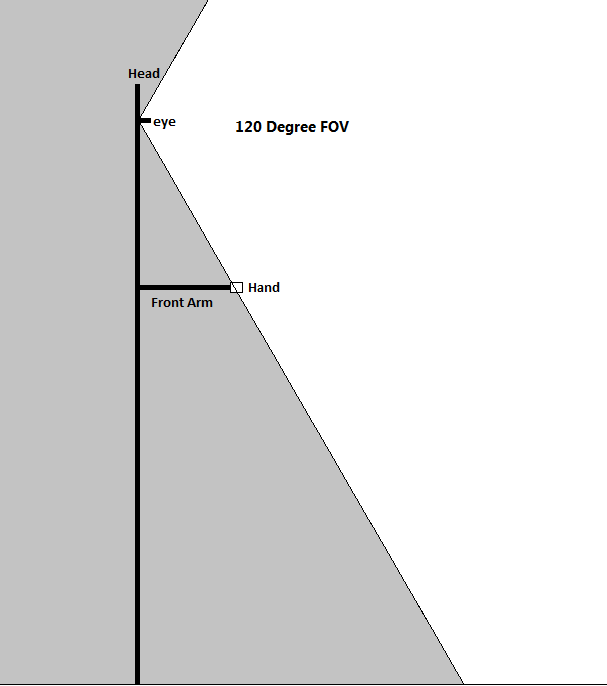 Your second graphic of the FoV with the hands in it makes the assumption that the vertical FoV is the same as the horizontal. This is not true. 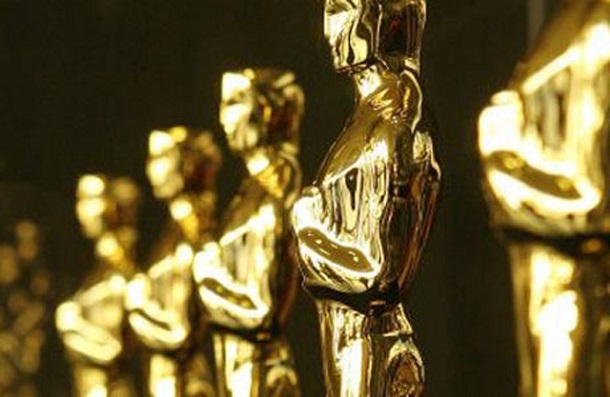 The generally accepted number is much closer to 25 degrees of vertical FoV.